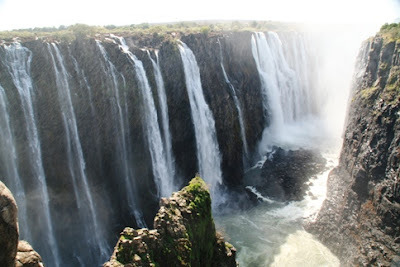 GOING ON ADVENTURES: Victoria Falls is called "Smoke That Thunders"
We see a roaring wall of water almost a mile wide plummeting 400 feet into deep gorges. 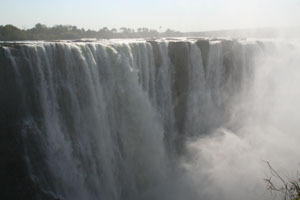 Very quickly we understand why Victoria Falls is considered one of the most spectacular natural wonders of the world. Its unusual form allows visitors to view virtually the entire width of the Falls face-on, making an incredible sight not duplicated anywhere else in the world. Straddling the border of Zambia and Zimbabwe in Africa, Victoria Falls is the largest sheet of falling water in the world. 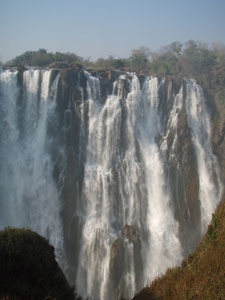 Although Scottish explorer and missionary David Ligingston was the first Westerner to view the Falls in 1855, it had been home for 3 million years to many African tribes, who gave it the name Mosi-oa-Tunya, the Smoke that Thunders. It’s a fitting description because during the end of the December to April rainy season, the spray coming off the rock wall is so heavy that it obscures the curtain of water, and it’s impossible to see the foot of the falls in the Zambezi River below. But this iridescent mist makes for incredibly bright and colorful rainbows in the sunlit sky. rock walls of Victoria Falls. Approaching Victoria Falls through the park’s tropical foliage-covered paths, we quickly feel the humidity and hear the ominous roar of water. Mist billows up above the trees during our mid-August visit, spraying people walking on established paths. Expecting to get wet while at the various overlooks, we're wearing rain ponchos to keep our clothes and cameras as dry as possible. In the dry summer season, from September to November, the flow slows with the result that the cascade resembles dozens of separate waterfalls. But that’s the best time to view the entire scope of the Falls and get a sense of its magnitude. It’s easy to see the rocky face of the cliffs and depth of the gorges during the dry season. 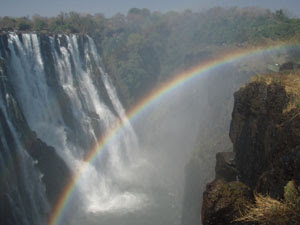 Victoria Falls National Park is a UNESCO World Heritage Site, protected by both Zambia and Zimbabwe governments. 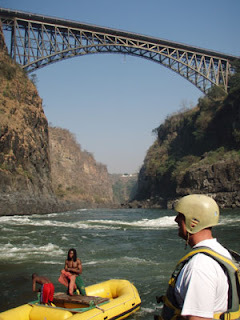 A bridge over the Zambezi River connects the two countries, and you might get to see bungee jumpers take a death-defying leap of 300 + feet off the bridge--just listen for the blood-curdling screams!. If possible, try to view the Falls from both countries, although you may need different visas to get these vantage points. Also view the Falls both morning and night for different perspectives--you might even see a “moonbow” in the evening. If you’re really adventurous, go rafting down the Zambezi River, the most challenging white water trip you can imagine. During our experience, we maneuvered through several class 5 rapids (getting totally submerged and soaked), and portaged around one class 6 (the highest rating). You can also take a helicopter tour or Flight of Angels, a ride in a fixed wing Cessna, for fabulous overhead vistas of the Falls and river upstream. Fishing, horseback riding, and elephant safaris are among other excursions that will provide unforgettable experiences and great wildlife spotting opportunities. Expect to get wet as the spray blows onto walking paths. Relax at day’s end on a two-hour Zambizi River sunset cruise, including drinks and hors d'oeuvres. The river is calm and full of birds and hippos (and crocodiles) submerged like submarines with just their eyes above water. Sunsets are incredibly red and simply spectacular. 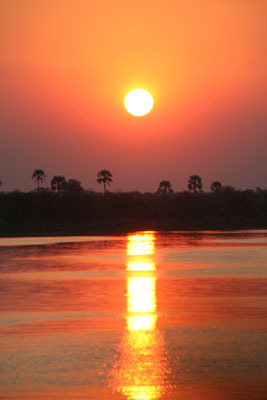 Gorgeous sunsets on the Zambezi River. Victoria Falls is easily accessible from all major destinations in Africa, and accommodations are readily available, even resorts from which you can walk in minutes to the Falls. The magic of thundering water, soaking mist, and deep, sheer gorges is simply awe-inspiring, and it’s no wonder Victoria Falls is one of Africa’s most popular tourist attractions.